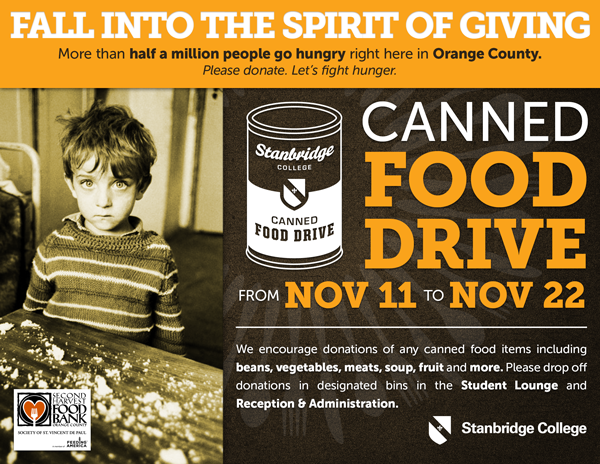 Stanbridge College REACH is proud to announce its November Canned Food Drive starting November 11th! In the last holiday season canned food drive, students and staff donated over 900 cans and other food items to help the Second Harvest Food Bank Orange County eliminate hunger in Orange County. Hunger affects more than 400,000 people in Orange County of every demographic. Many of those affected are the working poor who struggle to make ends meet in a county that has such a high cost of living. Help your neighbor put food on their table this holiday season and let’s continue to support the hungry and homeless. Cohort Competitions – Win a FREE Deluxe Pizza Party! For this food drive, we encourage each cohort to compete to donate the most cans! The cohort who donates the most will receive a FREE deluxe pizza party! If your cohort would like to participate, please select a representative to drop off cans throughout the week to the Media and Communications team in room 202 Monday through Friday 9:00 a.m. – 6:00 p.m. We will track the amounts donated and tally the cans at the end of the week (Friday, November 22nd). The cohort with the most donations will receive a free ice cream treat (one per person) and recognition on the Stanbridge College blog, Facebook, and other social media. Participation is optional, but we think a little healthy competition is always good to inspire service to our community. If you are able to, we encourage donations of any canned food items including beans, vegetables, meats, soup, fruit, and more. Location: Please drop off any donations in the bins located in the student lounge or Administration and Reception Suite 107. Almost half a million people go hungry in Orange County. Let’s fight hunger together. Support our Orange County community and give back to those in need.